Back in December when American rolled out their “Your Choice Essential” and “Your Choice Essential Plus” bundled fare options they updated the website booking process and managed to downgrade the user experience by removing the sorting feature. I guess the people that designed the website never actually used AA.com to book tickets, because it seemed like a rather huge and obvious oversight. When the update went live and the sorting feature was missing, American received howls of protest feedback from many of their best customers. We complained. They listened. Sorting is back! Your sort options are the same, but they work a litte differently. 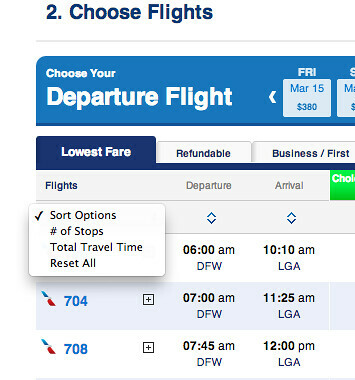 From a pull down menu you can sort by Number of Stops or Total Travel Time. The Sort by Price has been improved. Each column in the fare matrix can now be sorted independently. This wasn’t possible on the old site. 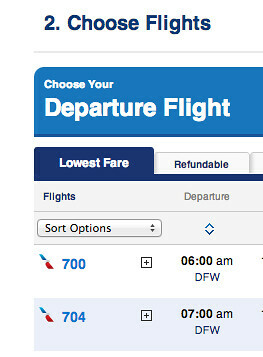 So now it’s much easier to find the lowest priced instant upgrade fare. Another feature that went missing with the upgrade was being able to view the results on a single page. Now you can “View all Results” on a single page. If you’ve been using Kayak, ITA, or some other site to research you fares, you can come back to AA.com now. It was a mistake to remove the sorting function to begin with, but I have to give American credit for responding to customers. Don’t forget the Frugal Travel Guy’s Monday Deal of the Day is sponsored by AAdvantage, so go here and share your favorite AAdvantage or American Airlines related tip for a chance to win 2,500 AAdvantage Miles! Good! That was annoying me that it was gone!! When searching international award travel across the Pacific, do it on the Qantas web site after enrolling in their FFP. Then call AA to book. It saves time and guess work when dealing with the agent on the phone. What about sort by Departure or Arrival time! Still missing?! Actually, sorting by departure and arrival time is there and works fine. Just use the arrows in the same way that you sort by price.